MCF and its members have been advocating for the Endow MN tax credit in the state legislature for the past several years as a part of MCF's public policy goal to promote charitable giving in Minnesota. 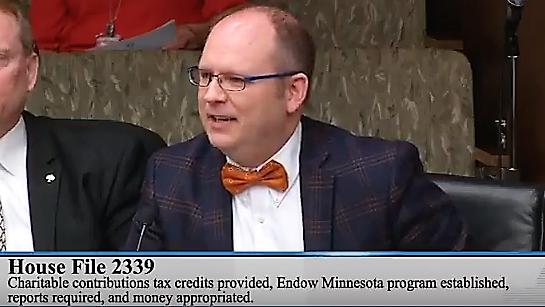 The Endow Minnesota tax credit legislation would promote community foundation endowment-building and expand the capacity of nonprofits to take advantage of legacy giving and the current transfer of wealth opportunity in Minnesota. Endow Minnesota has the potential of making $120 million in new grants available each year to support local community and economic development projects. MCF community foundation members from across the state have been heavily involved in crafting and advocating for this legislation. On Thursday, March 1, 2018, a hearing was held in the House Taxes Committee on Endow MN. With only a few days notice prior to the hearing, MCF members quickly mobilized to voice support and provide insight at the hearing, engaging in a variety of ways. A big thank you to the following members that chose to lend their voice and time to this important issue! Watch the hearing here. Three Members Testified at the Committee Hearing -- Thank You! Focus of Testimony – What is a community foundation? How does it have impact in the community? Focus of Testimony – Why are endowments important? How would a tax credit help build endowments? Why is this a more useful tool than a standard charitable deduction? Focus of Testimony – Statewide impact of community foundations. How community foundations support and serve all tax exempt organizations. Endow Minnesota is an opportunity for Minnesota to lead in philanthropy. Five Members Made Phone Calls or Wrote Letters to Members of the House Taxes Committee -- Thank You! MCF staff will continue to work with MCF members to mobilize around this issue, with the goal of seeing Endow MN included in the omnibus tax bill this legislative session session. Please connect with Bob Tracy or Katina Mortensen if you'd like to get involved! Those who contribute to the permanent endowments held by local community foundations would be able to choose a tax credit of 25% for gifts of between $5,000 and $100,000 annually [ranging from a minimum credit of $1,250 to a maximum of $25,000] rather than a standard charitable giving tax deduction in their state income taxes. Up to $4 million in tax credits would be awarded each year. To take advantage of the unique opportunity created by the unprecedented transfer of wealth in Minnesota, the tax credits would be available for only 14 years. The Endow Iowa tax credit, in place since 2004, has grown annual giving to permanent endowments in community foundations by more than 200 percent. In recent years, Maryland, North Dakota and Montana established similar tax credits. Efforts are underway to enact “endow” tax credits in Wisconsin, Ohio, Indiana and Kansas. It is becoming a national conversation.